I am so excited to be posting my 200th post! To celebrate, I'm sharing a product review of a great local business as well as a giveaway! Continue reading for more details! 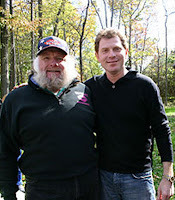 Joe and I love BBQ sauces and dry rubs. For a while, we were always coming home from the grocery store, gourmet shop, farmers' market, etc. with new sauces to try. It got to the point that we had at least a year's worth of BBQ sauce in our apartment. When we moved, we promised to finish what we had in the pantry before we bought new sauces! The past few months, I've been making my own bbq sauce. 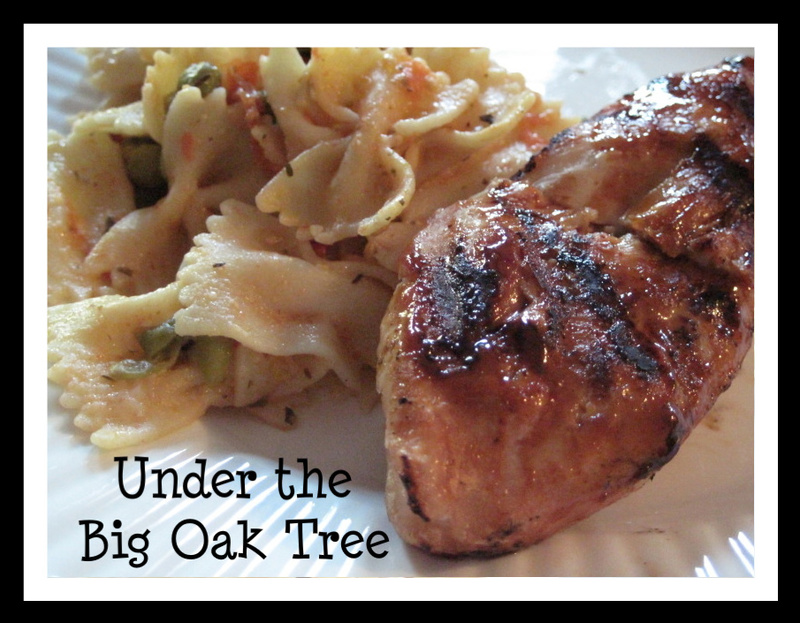 Amazingly, we were out of sauce on a night that I planned barbecue chicken for dinner. I found a recipe in a cook book and tweaked it a bit. Now, I try to keep a batch of my homemade sauce in the fridge at all times. Even though I make my own bbq sauce, it's always fun for us to try a new brand that we find at the store or hear about from a friend. 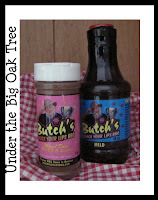 Recently, we had the chance to sample some Butch's Smack Your Lips BBQ products. The nice people at Butch's BBQ sent us a bottle of the Mild Smack Your Lips BBQ Sauce. And also a jar of the Mild Magic Dust Dry Rub. We really enjoyed both of the products and consider Butch's Smack Your Lips BBQ products to be "right up there" with our long-time favorite sauces and dry rubs! Joe liked the Magic Dust Dry Rub so much that he used it on his buttered potatoes instead of salt and pepper! And I can't wait to use the BBQ sauce in my Barbecue Chicken Salad recipe in place of my homemade sauce! Keep in mind, we did not use these products to their fullest potential and we still really think they are great! But if you want to use the barbecue sauce and dry rub as intended, then check out the recipes posted on the website including Butch's Barbecue Pulled Pork. 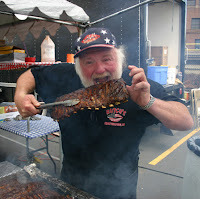 Have you heard of Butch's Smack Your Lips BBQ? No? Let me fill you in! Butch's Smack Your Lips BBQ has won over 600 awards, both national and international. Including Best Ribs in a Throwdown! 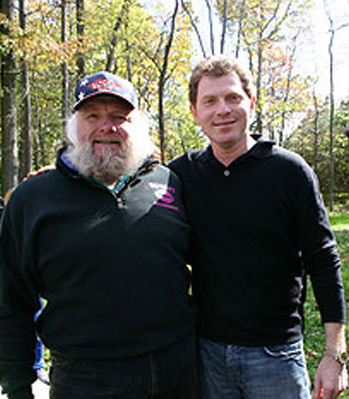 With Bobby Flay on the Food Network! I became familiar with Butch Lupinetti and his company while watching the repeat episode of Throwdown! My cousin was visiting for the weekend and was so excited to see her former employer on the show! (Turns out, a few of my cousins had worked for Butch in the past.) Since that weekend, I've seen the episode several times and each time I was pulled in by what his wife calls his "larger than life personality". Butch was born and raised on a farm in Pemberton, NJ. That is where he learned how to harvest and cook a pig. 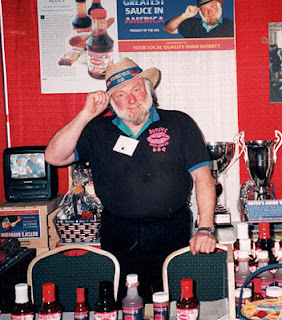 In the 60s and 70s, he toured with a rock band, opened a country western bar and in the late 80s he began entering in bbq competitions. He created a traveling barbecue pit that not only included a 10 foot rotisserie oven, but could hold 600 lbs of meat! And by 1990, he started Butch's Smack Your Lips Barbecue in Mount Laurel. There's even a Smack Your Lips BBQ Cookbook and other fun merchandise available on the website. Locals can also find Butch's Smack Your Lips BBQ at the Wells Fargo Center (formerly the Wachovia Center) in Philadelphia. Their booth opens 2 hours before any sports event or show scheduled at the Wells Fargo Center! Very recently, Butch passed away while vacationing with his family. I've been in touch with his wife, Lynne, and she tells me that they were devastated by his sudden passing and that they "are committed to keeping the business going as a viable entity, as a tribute to the passion Butch had for BBQ." "Cook it low, cook it slow, serve no swine before it's time"
Lynne also tells me that they will be updating the website to include Butch's most recent project: an instructional DVD that will guide you through the cooking process of ribs, pork, brisket and chicken. The instructional DVD will be available for purchase in about 30 days! A scholarship fund has been started in memory of Butch Lupinetti and has "topped $5,000 in donations". His family hopes that "a worthy student will use the scholarship to advance their cooking skills and become a master of culinary taste." Donations to the Butch Lupinetti Scholarship Fund may be made by sending your contributions to the Burlington County College Foundation for the Culinary Program, the Enterprise Center at BCC, 300 College Circle, Suite 256 in Mount Laurel. Now on to the giveaway information! 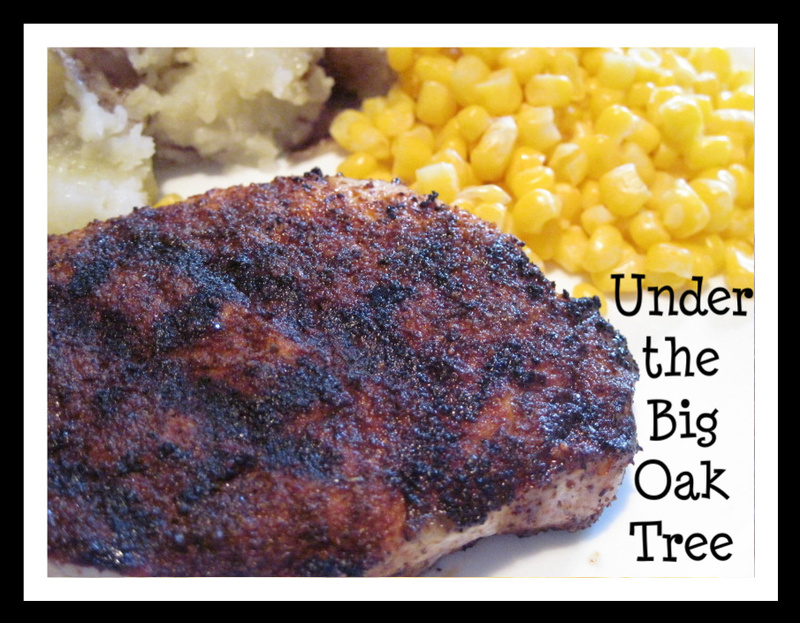 invites you to become a pitmaster in your own backyard! I know I already provided a lot of information from the website, but hey, just go check it out! You can earn up to 8 entries for your chance to win! Additional entries are valid only if the mandatory entry is completed. Each entry requires a separate comment. Leave 2 comments for tasks that earn 2 entries. Please include your email address with each entry. Giveaway ends on Sunday, September 26th, 2010 at 10:00 pm EST. Winners will be selected via random.org and contacted by email. Winners will have 48 hours to respond to claim prizes! Disclosure: I was not compensated in any way to do this review. Butch's Smack Your Lips BBQ provided me with 2 non-returnable products for my family to sample and review as well as the products provided for this giveaway. The opinions stated in this review are honest and my own. I learned that Butch even posted dessert recipes on his web page. Excellent story about him. I LOVE his quote for how to cook meat! "Cook it low, cook it slow, serve no swine before it's time" So true, so true! I clicked on his recipes and they all look awesome but was immediately drawn to the baked beans as they are my favorite! I make my own sauce sometimes to but we always buy some also. Hubs likes it with chicken! Thanks for a great giveaway, I would love to try it! We usually buy Sweet Baby Rays, I'd like to compare them. Thanks! I did not know Butch was born in NJ ! Never heard of him before, but it sounds like it would be GREAT BBQ! I'd like some NOW! I here ya "Anonymous",wish I had some now! Butch has won a ton of awards for his lip smackin' good BBQ. Giveaway! Don't forget to enter! Our Wish List just keeps getting bigger! Follow Us Monday Morning: I was featured!